Pair up fresh and dried herbs, or herbs and their essence, by smell. 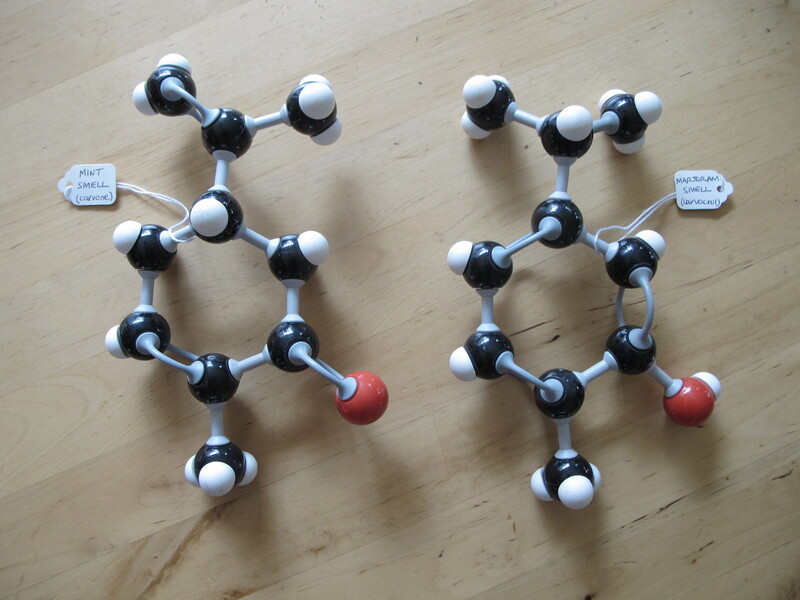 Optional: look at the smell molecule shapes. Try to pair up each fresh with dried herb, or dried herb with herb essence, or fresh herb with herb essence. Herbs may smell strong to discourage animals from eating them. You can smell the herbs and spices because some of the molecules leaving the herb or spice go up your nose and interact with molecules in your nose. We smell them when their unique shapes fit like jigsaw pieces into the inside of our nose, and stimulate a nerve signal to our brain, which we perceive as smell. Students smell the real herbs, by brushing their hands against them then smelling their hands. Match with bags of dried herbs, whose identity is hidden (see photos). The pairs of fresh herbs/dried herbs/essences probably didn't have exactly the same smells as they all release slightly different mixtures of smell molecules. However there is often a main molecule responsible for each distinctive herb smell, so we cue into this odour molecule to match the smells. Oregano has the molecule carvacrol in its smell. Anise seeds have the molecule anethole in their smell. Cloves have eugenol in their smell. Mint has L-carvone in its smell. Garlic has allyl- disulphide in its smell. Rosemary has eucalyptol in its smell. 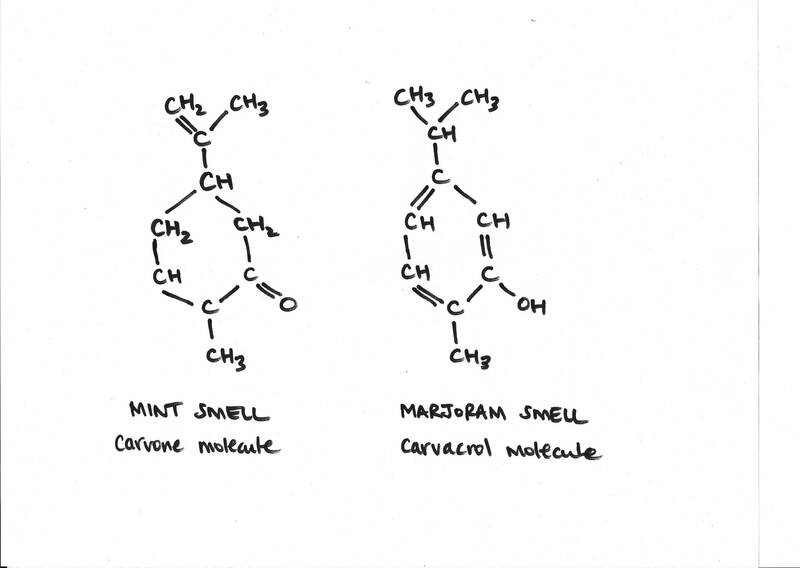 See if students can spot the difference between the molecules responsible for mint and marjoram smells. Although the chemical shapes are similar, they smell very different. Most smells are complex mixtures of many molecules so smells often mean something quite different to each of us. Squeeze and sniff the smelly bottles (containing essences). Look at the plant pieces inside the glass jars. Match them up. Students can also try and match each smelly bottle and jar of plant pieces with a picture of the plants they come from. For younger students, duplicate the smelly bottles, and ask them to match up the ones that smell the same - use fruity smells too. For very young students make into a game, where each table is a team. All tables are given the same-smelling tube at one time. The students at a table work together to try and guess what the smell is, and write it down. When the time is up, they hold up their written answer. Cedar wood is the trunk. Garlic is the bulb (underground leaves). 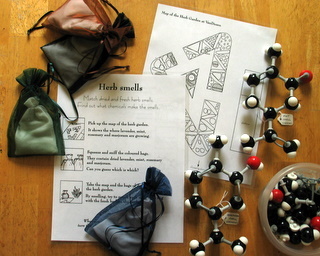 See the "smelly booklet" from the New York Hall of Science (attached) for comparing the smells of herbs and the single molecule responsible for their smell. Single molecules difficult to obtain and store, so only done in this museum setting.